By sending this booking your details will only be sent to Chez Mal Lounge and will never be shared with other third parties. By clicking this box you agree to the Terms and Conditions set out above. The beautiful bar & lounge area on the ground floor of the hotel has a relaxing atmosphere during the day for coffee meetings and casual lunches. In the evening the space is transformed with intimate lighting and background music, perfect for after work drinks and intimate dinners. 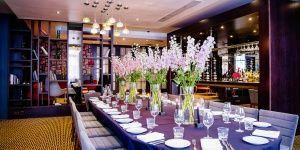 This area is available for exclusive hire and can accommodate up to 120 guests for a standing reception or 50 guests for a seated event. 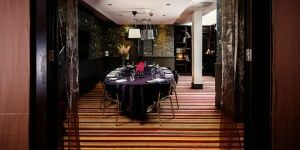 Not your typical meeting space, the Mal Lounge, located on the ground floor, is perfect for creative business meetings, conferences, team dinners and celebratory occasions. They can offer flexible layout able to accommodate anything from 15 up to 120 guests. The beautifully designed Mal Two, located on the ground floor, is the perfect place to enjoy an elegant and relaxed meeting, breakfast, lunch or dinner. Adjacent to the bar & lounge it offers flexible levels of privacy and atmosphere. The room is equipped with a 65” Smart TV and HDMI connection, wi-fi, background music, air conditioning and boasts natural daylight.